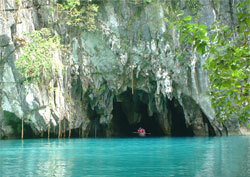 Our world has many other underground rivers, but the one in Palawan is the best from the traveler's point of view. You journey up this subterranean river in a small boat. The trip is adventurous. You view stalactites, stalagmites and other eerie limestone formations as your boatman-guide paddles his craft up the dark, meandering Underground River. A flashlight and lantern light the way. At 8 kilometers (5 miles), it is the world's longest navigable underground river. Your boat travels 1.3 miles of it and the trip takes 45 minutes. You can book a private or group tour - or make your own arrangements. If you do the latter, be sure you buy your entrance and tour boat tickets in advance at the park office in the nearby town of Sabang. The Underground River empties directly into the South China Sea, so the amount of headroom between your mandatory helmet and the low-hanging formations at the cave's entrance will be minimal at high tide.